This USB TV stick has an universal TV tuner built in to decode both analog basic cable channels or UHF/VHF channels for all countries in the world using NTSC, PAL B/G/D/K/H/I, PAL-M and PAL-N for TV broadcast standard. This tuner is also served as a RF to USB video converter for converting all RF coax feeds from cable box, satellite receiver or cable outlet or other RF signals into digital MPEG format for viewing or recording through the USB connection with a PC. This USB analog TV stick also provides composite RCA video and stereo audio input so users capture video/audio feeds from VCR/DVD player, game console, surveillance cam into digital MPEG formats for playback, collection, editing or disc production. It is also a great tool for digitizing analog video contents from VCR or DVD player into digital format for collection or further video works. 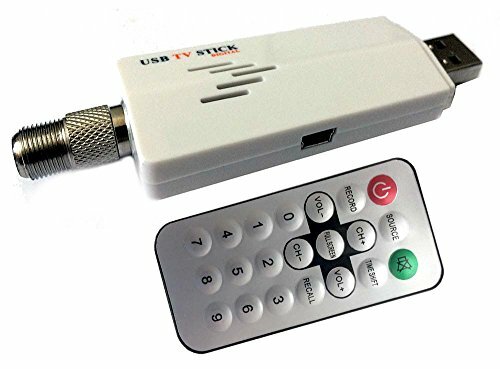 This USB TV tuner has bundled with TV DVR software with major functions such as TV channel recording, recording schedule setup, Time-Shifting, video capture, closed caption, image snapshot DVD/VCD burning, etc. Users can watch TV or recorded video and work on the PC at the same time. The TV video window screen can stay on top of the computer screen. TV video window can be moved and the TV window screen size is re-sizable. 2-in-1 analog USB TV tuner with DVR function and video frame grabber built into one. Universal analog TV tuner for worldwide TV system support in NTSC, PAL-B/G/D/K and PAL-M/N standards. Smooth video/audio streaming through high speed USB 2.0 connection. Featured with RF coax input, composite RCA video/audio input. Viewing or recording TV channels through PC in digital format for storage, playback, editing or disc production. Supports scheduled TV recording and time shifting function to pause, rewind, fast forward, rewind to replay a TV scene or skip the commercials. Supports all RF coax and composite video devices such as cable outlet, satellite receiver, DVD player, game console, CCTV camera, DVR, camcorder,etc. Advanced PC-based digital video recorder for recording feeds from antenna or coax cable TV feeds. Supports digital video recording in MPEG format and still image snap shot function in JPEG format. The bundled TVR software provides easy-to-use interface with all premium functions for all the entertainment tasks needed. Supports 16:9 wide-screen and 4:3 ratio for the TV video window size. Supports auto shut down of PC after the scheduled recording is completed. Full-featured IR remote controller included. Supports all latest Windows OS including Win10, Win8.1, Win8, Win7, Vista, XP.